J-term 1997 (winter semester at Messiah College) was over. 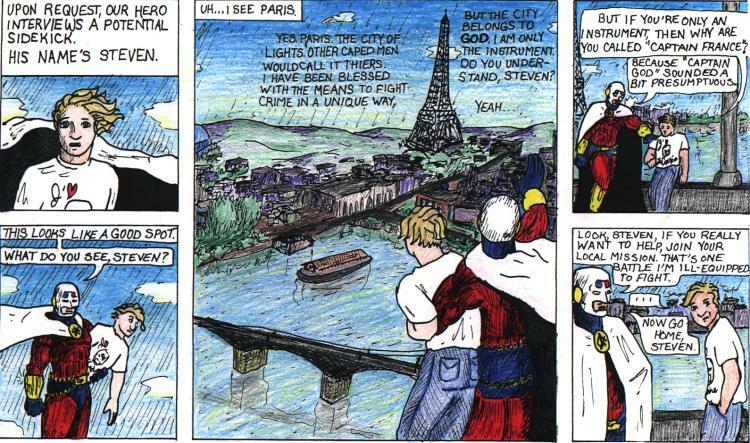 It had been about two months since the last issue of Captain France, and I had a bunch of new ideas. My roommate Andy had given me a book called Understanding Comics by Scott McCloud. It's a mind-expanding read that helped me to understand what comics actually were and new ways of thinking about them. A definite recommended read to anyone interested in producing comics. Anyway, I realized that the newspaper had given me a large block of space in which to work, but the only person forcing me to use eight even-sized squares of content was me. I decided to try a new format, with a large open panel in the center and two small panels on each side framing it. The new format grabbed the eyes of our readers and we got a lot of positive feedback (some of the only feedback we ever got). This strip was a good way to introduce any students new to the story in the spring semester and also refresh the memories of returning readers.